Endless Space was a game I probably could have learned to love but never invested the time or effort into learning to play properly. It was a sci-fi 4X game of epic proportions but with a certain sterile feel to it. Mechanically it was great but very little about the world it created inspired me to stick with it, to explore and conquer its expanses. Since Endless Space’s release we’ve also had the release of Endless Legend a game which not only fixed all the issues of Endless Space but brought a unique twist on the Civilization style 4X game. 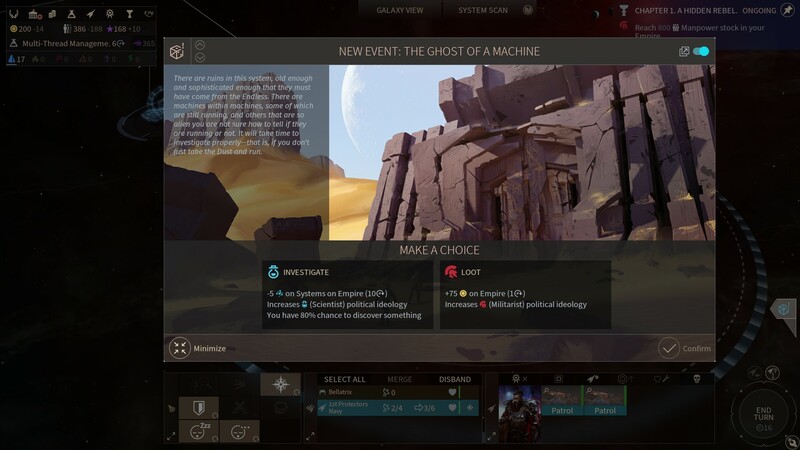 Has Endless Space 2 learned from the advances made in its planetside brother? Well…yes and no. Right from the offset Endless Space 2 makes a fantastic impression. It has what are quite simply some of the nicest menus and UI of any strategy game I’ve ever played. Everything is flashy and smoothly animated while showing all the necessary information to smoothly run your galactic empire (and a healthy dollop of flavour text to add depth to it.) It does a great job of making the shallower areas of the game seem more in depth than they are and the more complicated parts more accessible by showing them in smart ways. For example the whole political system is relatively simple, there are elections every few years (depending on your type of government) and different factions will gain influence in those elections based mostly on how you’ve been running your empire. Starting to build up for war? Militarists and Industrialists will gain influence. Been trapped in an ongoing war for a long time? Pacifists will start to fight back. 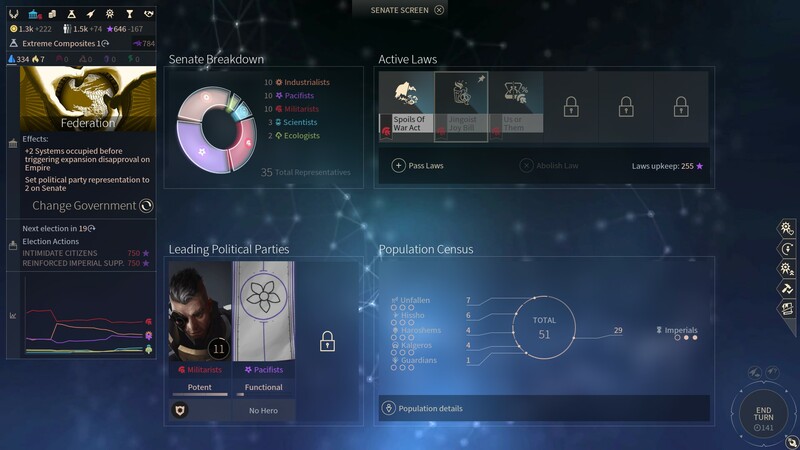 It’s not the most complicated system in the world but the politics screen is filled with flashy charts showing the influence of each party and the laws that can be passed based on who has the most influence and it all looks a lot more in depth than it actually ends up being. 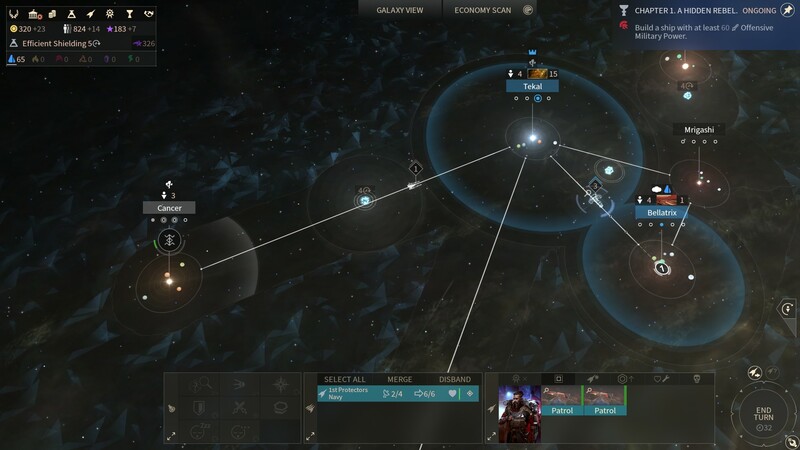 A lot of developers could learn from Endless Space 2’s UI. Another place where Endless Space 2 is a massive improvement over its predecessor is in terms of its setting. Each race plays significantly differently and has interesting backstories which explain why they are the way they are. For example we have the return of the greatest faction in a 4X game, Horatio. A race of beings started by a rich madman who crash landed on a planet with a cloning facility and proceeded to build an empire populated entirely by himself. This premise shapes how Horatio play, your population will generally be easier to keep happy for example because…well they’re you. Throughout each game story events will occur which let you make choices or give you side objectives to try to reach which will further progress and shape your empire. All of this is not going to seem new if you played Endless Legend but it’s a welcome addition to Space and goes a long way to fixing the original game’s lack of personality while fleshing out the individual factions further, adding more depth to their reasons for being there and for fighting. Building your empire is something of a balancing act, as with most strategy games. You need to research technologies to colonise different planet types, you need to increase your production capabilities to start building ships to defend those colonies and in turn require the research and resources required to make better ships. And ship need a crew. People are important in Endless Space 2. A warship is useless without soldiers to man it and so you need food to build up more and more people. Which then makes everyone unhappy because of high population counts so you build entertainment…and it’s hard to keep everything in check. Which is a good thing. 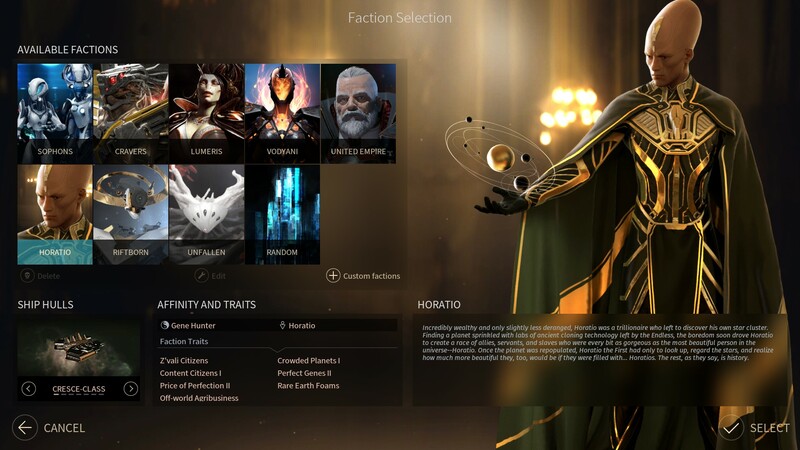 Endless Space 2 keeps you on your toes and personally it took me quite a lot of time compared to other 4X games to figure out how to properly balance these things and how to react to the events occurring which messed up my plans but I enjoyed every moment of it. War is inevitable. You just can’t have massive expansionist empires all hanging out around each other without someone someday stepping over a border and going “oh woops, you wanted to colonise this planet? My bad” forcing some kind of retaliation and unfortunately it’s here that the game starts to falter a little. 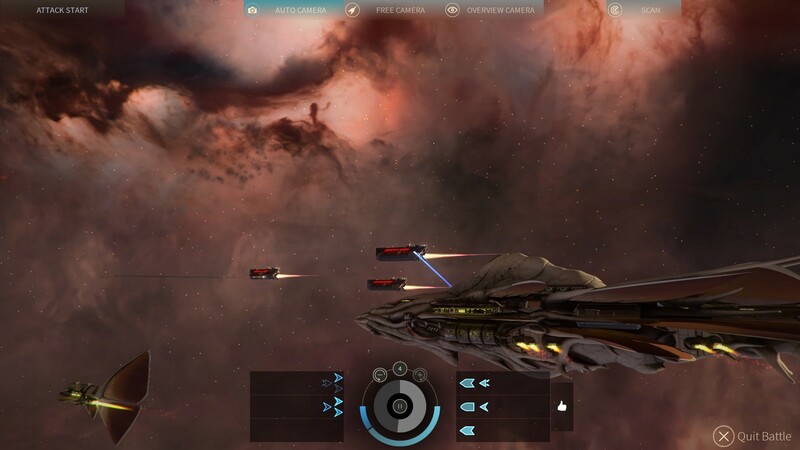 Combat involves building fleets, hitting attack and choosing one of three strategies for that attack. Raise your shields and go in guns blazing, be more defensive and do less damage but also take less damage or an interesting one which returns a little bit of money to you per ship you lose. The issue is, there’s not much beyond that and it often feels very much luck based. You can watch a cinematic version of the battle take place but there’s nothing really to do, you just watch this very slow space battle happen. It is pretty cool the first time, and it does look gorgeous, but it’s not something you’ll ever feel the need to do more than once. The ground combat has a slightly cooler aesthetic as it simulates battles on a holographic war table which is a cool visual but again pretty useless. There were many battles I went into with stronger ships in higher numbers and came away losing multiple ships and having no idea how it happened. Why did my enemy manage to chew through my battleships like they were a new intergalactic delicacy? And why when they tried a counter attack next turn did my ships completely wipe them out despite now being massive outnumbered? This lack of clarity just results in a reliance of treating ships like fodder. 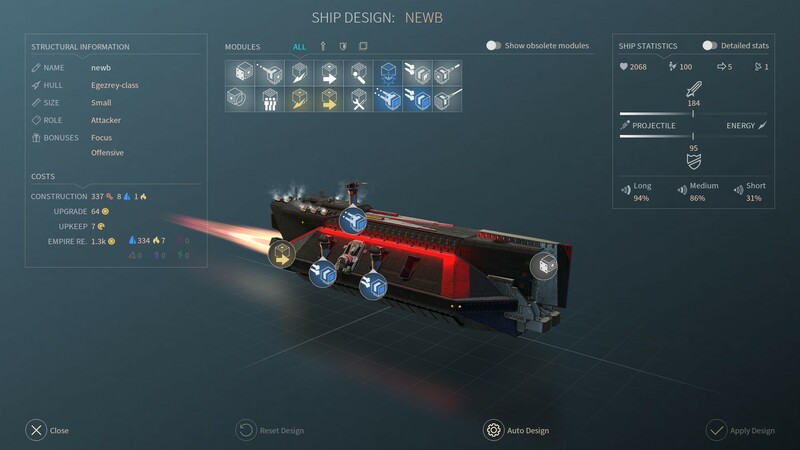 If it’s a dice roll whether you’ll lose a lot of ships or not in a battle the only real solution is build even more ships which just isn’t that fun. There’s an alright ship builder in there too though, which I’m not usually a big fan of but I actually ended up spending a bunch of time tinkering with the setup of guns on my ships. If you are looking for war however be prepared to start it yourself. Something I encountered a lot during my games where that the AI was very much all bark and no bite. They spend a lot of time sending you messages saying “Hey, we’re going to go to war with you like next turn” or if they’re your buddy “Hmm, we could share some science. We’ll send you a science next turn” only for nothing to actually come from it at all. It’s a weird one and I have no idea why it was the case. Was I missing the technology that let us share science? Did I change something by accident to make that other race not hate me as much? It’s a pretty minor issue as the game works fine despite that and the AI is mostly pretty great despite these hiccups. It’s great when you start to get on good terms with other empires and trade maps only to find the galaxy is bigger than you thought and that everyone has their own personal squabbles. The different factions feel like they are fighting against each other and those fights are somewhat shaping what they are doing. They still seem to stick to one strategy for victory and never deviate from it, but how they negotiate with you might change. For example an empire currently under invasion will probably be more open to making some deals or alliances than the one doing the invading would be. The 4X genre is one that has somewhat stagnated in recent years, with games like Endless Legend and Stellaris being the rare diamonds in the rough that shine through. 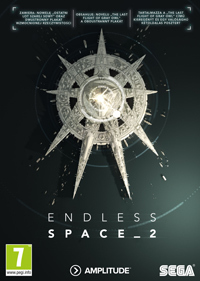 Endless Space 2 doesn’t really bring much new to the table like those games did but it is an incredibly polished and refined entry in the genre. In my opinion though, if you really want a turn based 4X game in this style but aren’t completely married to the Sci-fi theming? Maybe pick up Endless Legend instead. For Scifi themed entries however, Endless Space 2 is one of the best around. It’s a little strange to claim that watching the battles is pointless, then complain you don’t know why a battle was won or lost. Watching how a battle plays out is actually quite informative.